You might have noticed my slight obsession with the Duchess of Cambridge – she’s one of my favourite style icons, and I’ve always had a soft spot for the royal family. So I’m very happy to scoop up any Kate purchases I come across when they’re brought to my attention by the lovely community over at What Kate Wore’s Facebook site! One of my favourite ever shoes that Kate’s worn are the Corkswoon wedges – designed by the American label Stuart Weitzman, they were sold in Russell & Bromley stores here in the UK for a short period. Unable to get my hands on a pair, I plumped for the copykate Myra wedges from Hobbs, which retailed at £125. Thanks to a variety of reasons, I was only ever able to wear these out once, when I went to a Greek restaurant last year. The Corkswoon wedges – as they are called in the US – have been renamed to ‘SW COCO’, and I found out from R&B’s Twitter account that they were available again for the new season. (Also available in a pretty silver shimmer colour too!) Unfortunately, by the time I got myself organised (three hours…) my size (7/40) had sold out. I decided to take a chance and ordered the 6.5 but they were too small. So, I signed myself up to receive updates when my size is made available again. Every morning at 9am I’d get an email to say my shoes were in stock, but after checking, they were sold out again, leading me to believe that there was massive demand that R&B was keeping up with by getting in new shipments everyday. It turns out I was hilariously wrong, as I eventually emailed them to ask them if they could put a pair aside for me as an exchange. What had been happening was that the email system was telling everyone who was on the list when a new size came in, even if that wasn’t the size they were after. In fact, there were no new shipments and they weren’t expecting any more through(!) BUT, they checked their inventory and found a pair in Mayfair for me. I rang the store right away, and they were able to post the shoes out to me. And so, they arrived today. And thus ends the tale! As far as I can tell, these are the main differences: the colour of the navy on the Coco is deeper and more even. The nap seems to be shorter, which gives it a tidier appearance. The cork differs slightly – the Myra has a more spotted finish, while the Coco has a series of lines… (I tried to look up to see if these have a special name but I couldn’t see anywhere that they do!) When it comes to fit, the Coco actually fits me much better than the Myra wedge. The back seems to be higher, although the Myra wedge has a nifty piece of cord at the back which helps to maintain grip. Finally, the most obvious difference is the cute gold SW button at the back of the Coco wedge! If you’d like to see all the pictures in high res, you can visit my Flickr set here. You can also see another comparison between the Myra wedge and the Next wedges that they did last season which were a good match for the Coco wedges here. 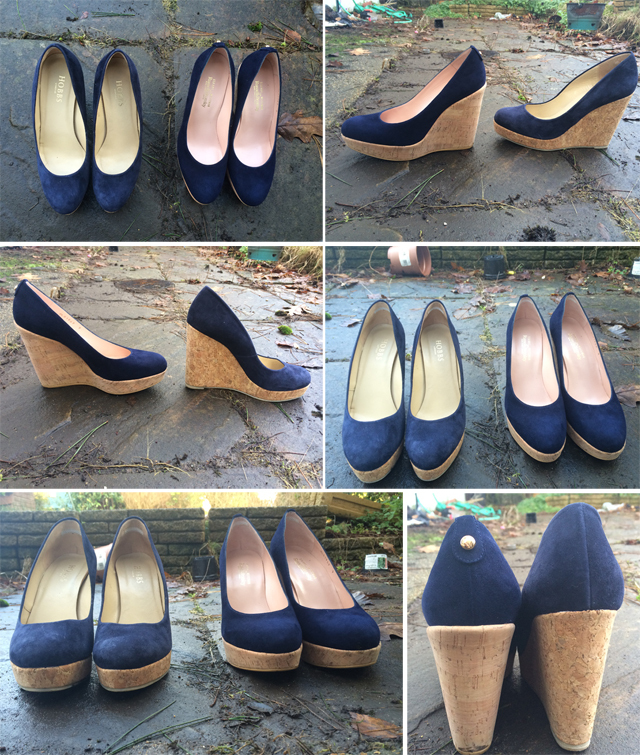 As I don’t need both pairs, I’m going to be selling my Myra wedges – they’re size 7/40 and if you’re interested just email me using the contact tab above! As they fit me better than the Myra wedges, I decided to keep the Coco, but I honestly think that the Myra wedge is a fantastic replikate, especially considering the enormous price of the originals. The Cocos are nicer, but twice as nice…? I’m not certain! Lovely outfit, and beautiful wedges! They look comfortable, are they? Yes, both pairs are really comfy! I am trying to get ones but to Portugal it is impossible. Hi! How do you find the Myra to fit? I am between a 38 and 39 and trying to decide if I should size up or down? It’s tough to say – I’ve got shoes that range from 39 to 40 and mine are 40s, so perhaps the upper end of your scale is better. I’d describe the fit as true to size, though! To be honest, I didn’t take a note of this when I was trying them on side by side, but the Hobbs had a looser fit on me, so maybe those would be wider? 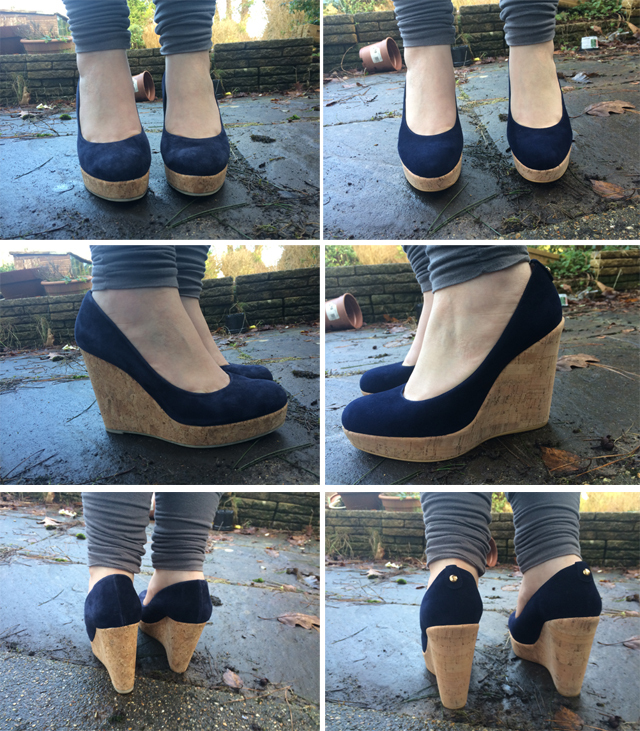 There’s definitely more coverage on the foot with the Myra wedges. I think it might be a good idea to ask R&B if they can advise you on the fitting of the SW wedges compared to the Coco Pops. I’m sure they’d be able to compare the two for you if the Coco Pops fit well! Thanks very much for your quick reply! 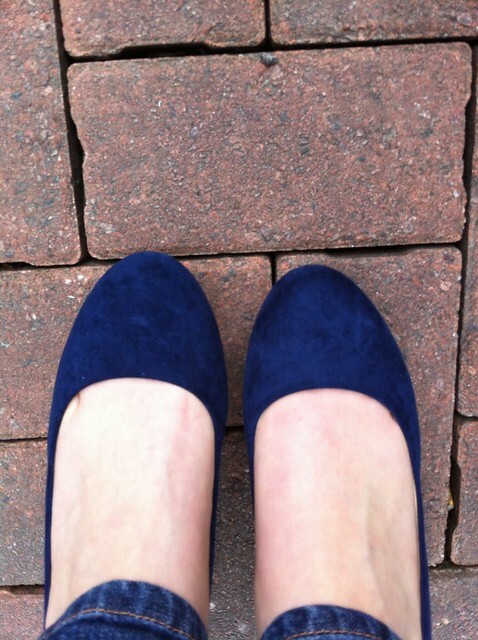 Hobbs actually have a sale on, the blue Myra’s have sold out but I’ve bought the mushroom ones for £49! Oo, that’s good! I was really tempted by those the first time around! Hopefully if they’re not a good fit you can return them… But I hope they fit well because they’re lovely shoes! I’d be happy with either… if only I could get them in NZ…. Thanks for sharing this!! I’ve just discovered your blog and will be so interested to buy the Myra if they are still on sale? Thanks for getting in touch – unfortunately I have sold these now! Just stumbled across your blog! Love it! Oh I admire the Duchess and her style greatly too! I can’t wait to own my own pair pair of SW COCO! Did you find the Corkswoon to be too high? I wouldn’t mind owning a pair, but I worry I wouldn’t be able to walk in them. They are a little bit high… If you’re not comfortable in them, I would definitely look for a similar pair which have a lower heel… There are lots of the same style!